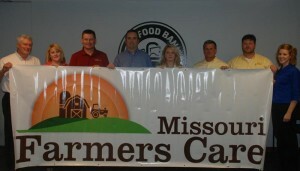 Missouri Farmers Care along with the Missouri State Fair and Ford auto dealers announced today a summer-long food drive campaign to benefit Missouri’s six food banks. Concluding with “Missouri Farmers Care Food Drive Tuesday!” at the 2011 Missouri State Fair, the campaign aims to help the roughly 343,000 Missourians experiencing hunger. Beginning in June, Missouri Ford dealerships will collect canned food donations through Aug. 15 in exchange for dollar-off Missouri State Fair admission coupons. Additionally, Missouri farmers and Ford will collect canned food items at the fair entrance Tuesday, Aug. 16 for a one dollar discount on fair admission. The announcement was made during a live AgriTalk broadcast at The Food Bank for Central & Northeast Missouri. Participating adults may redeem dollar-off coupons for up to four canned food items; seniors three; and children a maximum of one item. All donations collected will be distributed to the six Missouri food banks that serve the state’s 114 counties. Additional information regarding Missouri Farmers Care and Missouri agriculture can be found at www.MoFarmersCare.com.